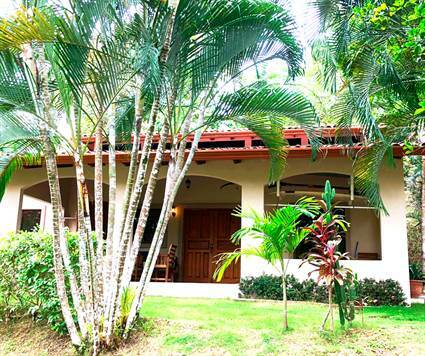 Three Bedroom Two Bathroom Surfer Retreat House For Sale in Valle Perdido Playa Hermosa. A surfer’s dream house tucked into the rainforest – featuring high vaulted ceilings, natural ventilation design, and loft storage area. Lot has lots of shade trees, room to expand or add a pool. This community is located in the Central Pacific Costa Rica town of Playa Hermosa, just south of Jaco. Driving time is currently 1.30 hours to the San Jose airport. It\’s 5 minutes to the beach from the house. The community includes Costa Rican tropical forest with several streams, providing the habitat for numerous plant and animal species. The Owner\’s Association provides service to all property owners in the areas of security, road and landscaping maintenance, potable water service, property management service, and administration. Completed infrastructure includes concrete roads and drainage, a security/maintenance facility, electric to houses, A private well provides water to the homes.